Our priority is that Children are safe from harm, happy and learning well with self-belief, aspiration and support to be their best: Walsall children are provided with the best start in life so they can fulfil their potential and make positive contributions to their communities. Walsall’s Child Health Profile (March 2017) indicates that the health and wellbeing of children in Walsall is mixed compared with the England average. The infant mortality rate is high and the child mortality rate is similar to the England average. The level of child poverty is worse than the England average with 30% of children below 16 years of age living in poverty. Levels of and breastfeeding initiation are worse than the England average. Children in Walsall have worse than average levels of obesity: 11.3% of children aged 4-5 years and 25.5% of children aged 10-11 years are classified as obese. The teenage pregnancy rate has been reducing well for the last 3 years, but it remains higher than the England average. In 2015/16, 59 teenage girls gave birth which represents 1.6% of women giving birth; this is higher than the England average. In response to the outcomes highlighted above, Walsall’s Health and Wellbeing Board commissioned a study to better understand infant mortality rates the issues and implications for Walsall. A focused task group has developed a strategy to reduce infant mortality and deliver against an action plan. Good attainment at GCSE level equips young people to move confidently onto the next phase of their lives. The gold standard of each young person achieving 5 or more A*-C grades including English and Maths remains a key challenge for Walsall. Education is a key social determinant of inequalities in society. Good attainment at A/AS Level or equivalent is equally important to access further educational opportunities and/or employment opportunities. In 2016, the percentage of pupils achieving 5+ GCSEs at A*-C including English and Maths slightly increased by 0.3% on the previous year, from 50.8% in 2015 to 51.1%. The LA remains below the SN average (52.4%) for this measure, but the gap has increased to 1.3% this year. The national average has increased to 53.5%, meaning that the gap to national is now 2.4%. 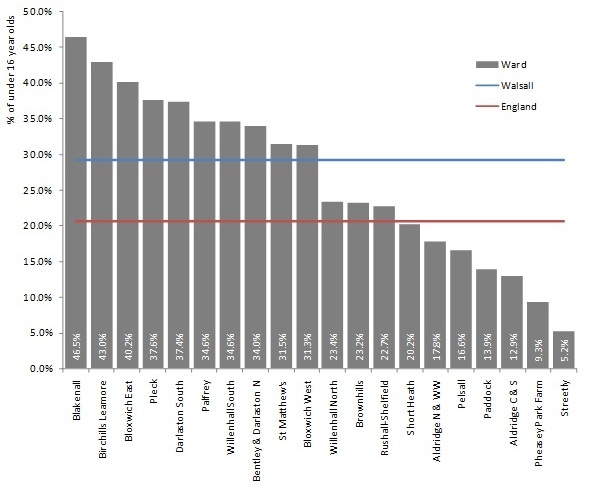 Walsall’s current LA ranking nationally has decreased from 126th to 133rd in quartile band D for this measure. The child poverty figures for Walsall (2011) show that there were 16,145 children under 16 living in low income families – representing 29.2% of all children in the borough. This was below both the England average of 20.6% and the regional West Midlands average of 23.8%. Walsall ranks as the 26th worst performing area for child poverty out of 326 local authorities in England, putting it in the worst 8% nationally. This is poorer than its position in 2006, when it was among the worst 12%. As with the national and regional figures, the rate of child poverty has varied across the borough over the past few years. The slight improvement seen in 2008 (when the number of Walsall children in poverty fell to 15,665) were wiped out in 2009 when the impact of the recession – and a subsequent rise in benefit claimants – saw over 1,000 additional children in poverty. Since then the numbers and rate have reduced again slightly, following the national and regional trend. We can see that the number of children living in poverty varies widely across the wards, from a maximum of 46.5% in Blakenall, to a lowly 5.2% in Streetly - in a wider economic sense these two wards are opposites of one another. 13 (65%) of the wards within Walsall feature child poverty levels higher than the national average, but 7 (35%) fall below - several significantly so. This highlights the diverse socio-economic geographic spread across the borough.